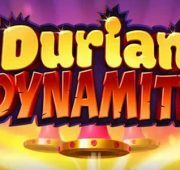 Review of: Play Divine Dreams Slot Free Online by Quickspin, at Slots Promo! 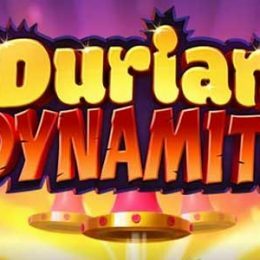 Divine Dreams is a fascinating new slot from Quickspin, set within the deep rain forests of Indonesia and offering 243 ways to win. Within this forest a Goddess of Wealth and Prosperity is worshipped. It is said she will bring a successful harvest to those on the island. 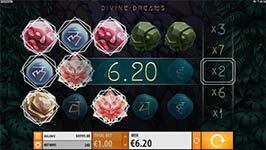 Divine Dreams is very feature rich and one of the very cool features is that you will have a multiplier on each win! Bonus Reel – The special bonus reel spins every game round. Bonuses trigger when they land within the Hit area and can include Mystical Multipliers, Yin Yang Wilds, Sacred Re-Spins or 3 Extra Spins (during Free Spins). Yin Yang Wild Symbol – The Yin Yang wild landing within the Hit area on the bonus reel activates the Yin Yang Wild feature. 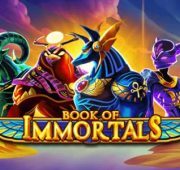 Two lotus flower wilds will be placed randomly on reels 2, 3, 4 and 5 and a random win multiplier ranging from 1 to 10 will be awarded. Lotus Flower Wild Symbol – Lotus Flower Wild Symbol substitutes for all symbols except Free Spin symbol. Lotus Flower Wild Symbol is present on reels 2, 3, 4 and 5. Sacred Re-Spins – Sacred Re-Spins have two levels, namely Super Re-Spin and Mega Re-Spin. A super re-spin symbol landing within the Hit area on the Bonus Reel activates Super Re-Spin, the first level of Sacred Re-Spin feature. Super Respin is played with upgraded win multipliers (4, 5, 6, 7, 8, 9, 10 and 20) and Mega Respin Symbol on the Bonus reel. Mega Respin Symbol landing within the Hit area of the Bonus Reel in the Super Respin awards one Mega Respin, the second level of Sacred Respins. Mega Respin is played with upgraded win multipliers (7, 8, 9, 10, 20 and 30) on the Bonus Reel. Sacred Respins are played with more wilds on reels 2, 3, 4 and 5. 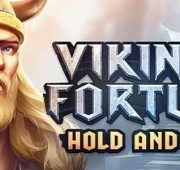 Divine Free Spins – 3, 4 or 5 Golden Goddess Free Spin symbols in the base game trigger 8, 12, 20 Free Spins respectively. 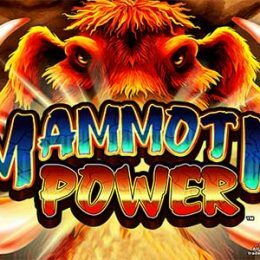 All the Bonus Reel triggered features in the base game can be activated in the Free Spins. 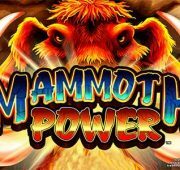 +3 Free Spin symbol landing within the Hit area of the Bonus Reel awards additional three Free Spins.